Australian and international delegates from the 5th National Men’s Shed conference took to the road to study the secrets of the success of the Men’s Shed movement. It was early morning and a convoy of cars drove through the streets of Ballarat. The Men’s Shed crawl had started. Around 50 people had car pooled and were beginning a day-long guided tour of five of Victoria’s men’s sheds. 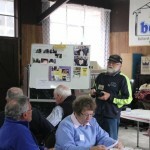 The shed crawl was a break from the two day 5th National Men’s Shed Conference held from 27 to 29 October in Ballarat. The mood was jovial. Included in the group were visitors from Ireland and the Netherlands as well as visitors from most other Australian states keen to observe first hand what it is that has made Australia’s men’s sheds such a success. First stop was the Ballarat East shed, followed by sheds at Buninyong, Winchelsea, Norlane (Geelong) and Geelong East. Sheds can vary in the way they’re managed, who they partner with as well as in the diversity of activities they offer. 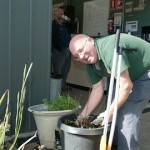 What they have in common is good relationships with local organisations and a positive impact on shedders’ self-esteem. Sheds offer a place for men to talk, work together on projects, and feel less socially isolated. ‘At each stop we saw how the sheds are highly regarded and welcomed in their local communities, and how that value is expressed in different ways,’ Paul said. At Buninyong, it was the support of the wives encouraging the men to attend the shed; at Winchelsea it was the auspicing of the shed by the neighbourhood house; at Geelong it was the strong relationships with the local council and local community groups who shared the premises. Men’s sheds began in Australia in 1996 to provide social interaction and improve the wellbeing of men who are no longer in the workforce. Currently there are over 1000 sheds registered in Australia. Men’s sheds have since spread to New Zealand, Ireland, Scotland, the US and are planned for the Netherlands. The 5th National Men’s Shed Conference was hosted by the Victorian Men’s Shed Association in conjunction with the Australian Mens Shed Association (AMSA).